Aspen Notre Dame de Bondeville's first production of Mono-embolex in an enhanced prefilled syringe with an automatic device that prevents needle injuries to patients once the product is injected. 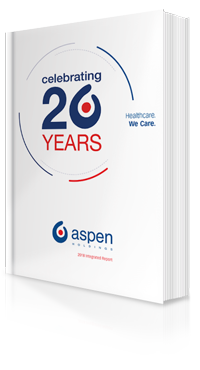 Our strategic objective of supplying high quality, affordable medicines and products is underpinned by our own manufacturing capabilities and the vertical integration of certain aspects of our supply chain. Our 25 manufacturing facilities present a range of production capabilities and capacities aligned with our current and future commercial objectives. These include injectables, oral solid and semi-solid dose, liquids, steriles, biologicals, APIs and nutritionals manufacturing. An overview of the Group's strategic manufacturing capabilities is set out here. During the last year, our strategic manufacturing projects continued to focus on the alignment of our facilities with our manufacturing and commercial strategies, enhancing technology and our quality and compliance standards, policies and procedures. Ongoing investment in the upgrading of our world-class manufacturing facilities as well as implementation of state of the art electronic systems ensures our ability to supply quality products, ensures ongoing compliance to GMP and creates increased manufacturing capacity to meet both current and future operational requirements. Capital expenditure on the replacement and expansion of property, plant and equipment amounted to R2 145 million (2017: R1 484 million) with a further R2 800 million planned for 2019. Following the anaesthetic transactions with AstraZeneca and GSK, we have integrated the manufacturing sites responsible for the supply of these products into our supply chain network, which provides us with a strategic opportunity to pursue manufacturing synergies. Significant capital projects are planned for the Port Elizabeth, Notre Dame de Bondeville and Bad Oldesloe sites in order to transfer the manufacture from AstraZeneca, GSK and some external supply contract manufacturing sites over the next five years. We remain focused on increasing the complex manufacturing capability at the Port Elizabeth site. The Bad Oldesloe site's ability to provide specialised and flexible manufacturing and packing capabilities, as well as its favourable location within the European market, further bolsters our ability to deliver competitive and bespoke manufacturing solutions. Introduced serialisation capability across the facilities to ensure compliance with the various serialisation requirements globally. Consolidated products onto a reduced number of packaging lines achieving efficiencies and reduced maintenance costs. Commenced activities to introduce the Anaesthetics portfolio, a significant step in the evolution of this site. The infrastructure build phase is nearing completion and equipment is in the process of being installed. The introduction of these new products will see the export volume move from 20% to more than 50% with more than 700 additional stock keeping units ("SKUs") being added to the existing portfolio. Developed and implemented a new safety device for Arixtra and Mono-embolex. The new safety device ensures better removal of the needle shield, enhances manufacturing efficiency by 2%, results in the use of less plastic and achieves cost reduction. Commenced the manufacture of fondaparinux crude and supplied the first batches to the Notre Dame de Bondeville site for purification. Completed the certoparin facility and commenced the production of validation batches that will be used for commercial batches after the required regulatory approval is obtained. Initiated various projects to reduce water consumption across the site and secure alternate sources of water to enable retention of normal operations during times of highly constrained municipal water supply. More details are provided Natural capital. Our manufacturing network also comprises supply from numerous contract manufacturing organisations situated globally. A number of the products manufactured in the external network have been earmarked for transfer to our own manufacturing sites over the next five years. This move will ensure ongoing supply sustainability. We have an internal team of supply chain and quality experts who ensure that all the requisite controls are in place to facilitate supply, on time and in full, and in compliance with our required quality standards. We have three infant nutritional manufacturing sites globally, located in Johannesburg, South Africa; Vallejo, Mexico and Auckland, New Zealand. The Johannesburg and Vallejo sites are fully integrated infant nutritional manufacturing sites where raw ingredients (including milk powder) are converted into infant milk powder through a spray drying and blending process. The product is then packed into various formats for sale to consumers. The Johannesburg site also has an ultra-high temperature ("UHT") liquid facility for the manufacture of infant ready-to-feed products. The Auckland site is a blending and packaging site only and operates as a joint venture between Aspen and New Milk Holdings. The infant formula base powder is manufactured by strategic partners based in Australia and New Zealand and delivered to the Auckland site for final blending and packaging in various formats. The Auckland site is one of a few global infant nutritional manufacturing facilities that has CNCA approval, allowing it to manufacture brands for sale in China. 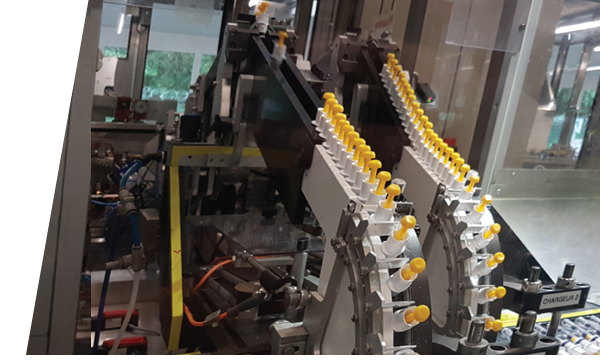 The business also introduced capability to manufacture product in sachets (including 1g sachets) as well as a glue carton erector to improve quality and efficiencies in the packing process. A "high lid" applicator has also been installed for supply to the Chinese market. Our ongoing investment in acquired intangible assets and new manufacturing capacity, mostly related to the future insourcing of selected anaesthetics manufacturing, has contributed to a significant increase in total asset value. 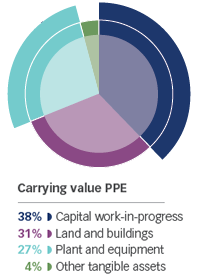 Since the contribution to earnings arising from these multi-year projects will only be fully realised when the assets become fully productive, we expect an improvement in the return on total assets in the medium term. We have a strong focus on continuous improvement initiatives and savings plans to enhance production efficiencies and optimise economies of scale across the Group. Comprehensive, detailed, multi-year savings plans, covering all aspects of the operations, are progressing to plan and the improvements to the Oss and Notre Dame de Bondeville sites are poised to deliver significant future cost savings to the Group. The progress made in achieving these plans is monitored on a regular basis. By owning our strategically important manufacturing capital, we are able to better manage our product quality, production efficiencies and cost competitiveness to ensure responsive management of the supply chain. This, in turn, supports the maintenance of Group normalised EBITDA margins. The Group normalised EBITDA margin has improved slightly, mainly as a result of the margin benefit of the residual rights to the AstraZeneca anaesthetics acquired with effect from 1 November 2017 and improvements in the cost of goods of the Thrombosis portfolio.